The security system permits the user who has forgotten their password to go into the system with their email account and request a password reset action. The password reset changes the previous password to a new password of their choice. Enter your email address and click on "Send Instructions"
Enter new password in the password reset screen. You tell the system your email address and it sends you an email to which you (and only you) would respond (thus, certifying to the system that your email response was really from you). Part of this "round-trip exchange of emails is a system-generated "token" that sets up a secure "handshake" between your computer and the RAFINO.org server. When RAFINO.org gets your response, it verifies that the token received is the token sent and the email address (yours) is the one to which the token was sent. The system then allows you to tell it the new password you have chosen for your account. You have tried to login and cannot remember your password. After entering your email address, you click the "SEND Instructions" Button. This will cause the system to send out an email to the your email mailbox, using the email address you just entered. That email will contain a special token that the you will take back to the system to confirm your identity and get the password reset. Once you have clicked on the "SEND Instructons" button, the system displays a message confirming that the instructions have been sent. 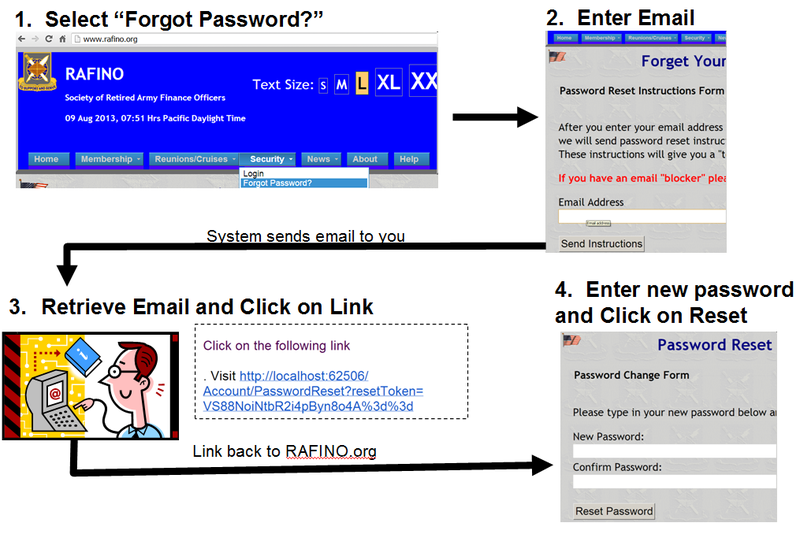 Back in the RAFINO.org security system, you are in the "Password Reset" screen. Here, you can tell the system what you want your password to be (entering it twice, JACS-style, to prevent mistakes). After entering your desired password, you must click on the "Reset Password" button to make the system store and remember it. Once you have done this, the system updates your security account with the new password and clears the screen, signifying completion of the task. From this point forward (until the next time, if any, you reset your password), your password is the newly assigned password. Both the email address and the password are CaSe-SeNsItIvE! The most common cause of a password not working is the user working with CAPS-Lock on or inadvertently capitalizing a lower-case part of a password.